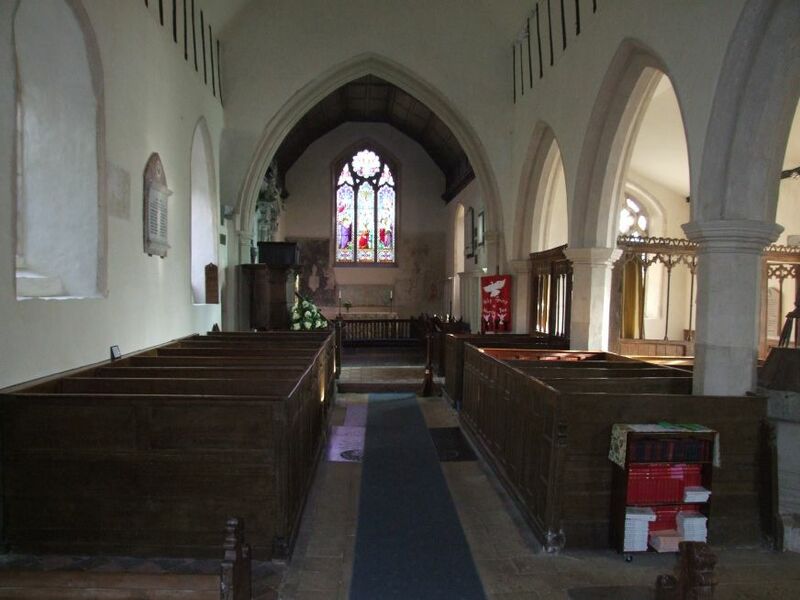 Almost ten years ago, Brent Eleigh was one of the first churches that I visited for the Suffolk Churches site. It was so early on, I didn't even have a camera with me, and had to rely on the kindness of others for the first entry on the site. I called back a couple of times in the years after, but it was not until a beautiful day in early February 2008 that I came back in an attempt to do it justice. Quite frankly, I had been a bit out of my depth on my first visit. 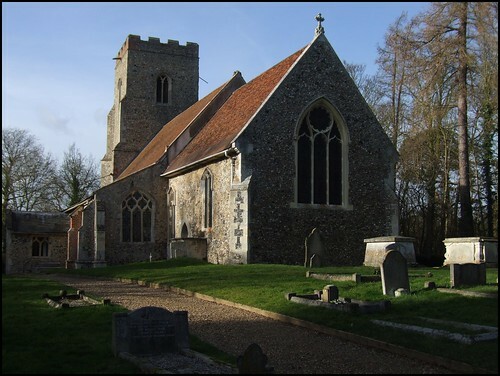 St Mary is a church of outstanding interest, but little known, and little documented, for the outstanding treasure of the church was not discovered until 1961. But what I certainly recognised then, and saw again coming back to it, was this this is a stunningly lovely building; one of the most perfect little village churches in all East Anglia. Brent Eleigh sits in the valley between Lavenham and Monks Eleigh, and was once one of the "cloth villages", where wool was spun in river-backed courtyards for the Lavenham merchants. Many of the late medieval cottages survive, but, unlike at Monks Eleigh, the village street is now bypassed. The name of the village reflects a dramatic event. At some point in its history, it was destroyed by fire (Brent='burnt'). Not far away, there is Bradfield Combust, a name denoting a similar incident. The church is along a back lane to Preston, a backwater in a village which is ordinarily quiet anyway. But the graveyard itself was full of robust birdsong in the late winter sunshine, as I retraced my steps of a decade before. The old door still stands, with its ironwork latch. I lifted it, and stepped into the cool inside. One of the stories that haunted me as a child was that of Howard Carter finally discovering Tutankhamun's tomb in the Valley of the Kings. If you remember, it was on one of the last days, just before the money ran out; Carter breaks a tiny hole in the seal of the door. He shines his torch through at the treasures beyond. "What can you see?" asks a breathless assistant. "Wonderful things", whispers Carter. In 1961, the Victorian reredos was removed from the sanctuary of St Mary, to enable a repair to the east wall. Traces of colour were visible behind the thin layer of plaster. Gently, it was removed, revealing, as in Carter's words, wonderful things; for here are some of the finest and most beautiful wall paintings in Suffolk. They date from the turn of the 14th century, making them roughly contemporary with those at Little Wenham. The figures are similarly angular yet fluid, as though in motion. In the centre is the crucifixion, at once a delightful example of medieval folk art, and yet also one of the most powerful medieval images in the Suffolk canon. If this was in the V&A, you would travel to London to see it. But if you look closely, you can see that whoever the artist was, he wasn't very good at feet, so presumably he was local. St John and the Blessed Virgin flank the crucifix, a typical early rood group, of which so few survived after their proscription by the Anglican reformers of the 1540s. 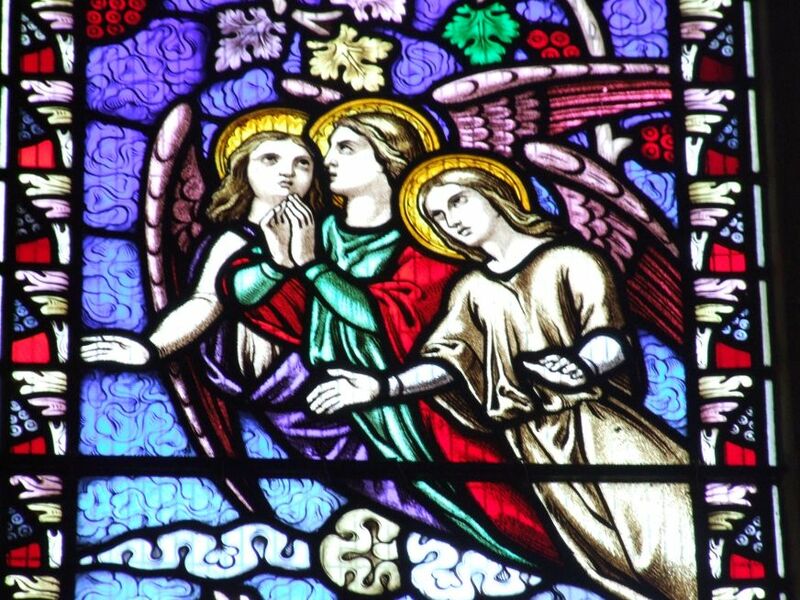 To the left are two angels censing a space with thuribles - how that must have outraged those protestants! - and the space must have contained an image bracket, possibly for a Madonna and child. Perhaps the most interesting scene is to the right of the crucifixion. This shows the Harrowing of Hell, more familiar from Orthodox churches, where it is usually a central image. Christ descends into Hell to free Adam. But the most intriguing feature is the figure in the bottom corner, who is probably the donor. Part of his dedicatory scroll survives. 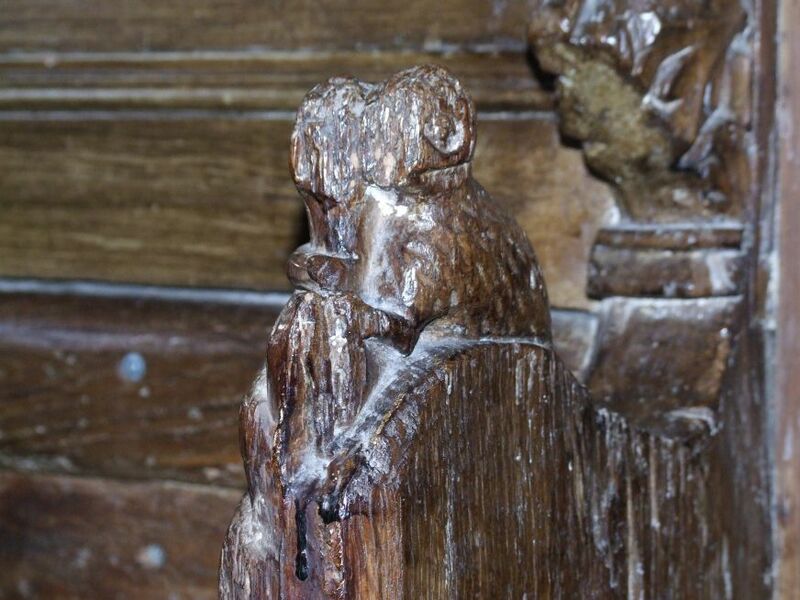 The two outer parts were painted before the central part, and we may actually be seeing a later rationalisation - when the rood group was painted, the other two groups were probably whitewashed. This would fit in with what we know was a falling out of fashion for non-liturgical wall paintings in the early years of the 15th century. Many seem to have been whitewashed then, a full century before the protestant Reformation, not to see the light of day again for nearly half a millennium. Eerily, the scene in the central painting is echoed in the 19th century glass above, although of course the Victorians cannot have known about it. 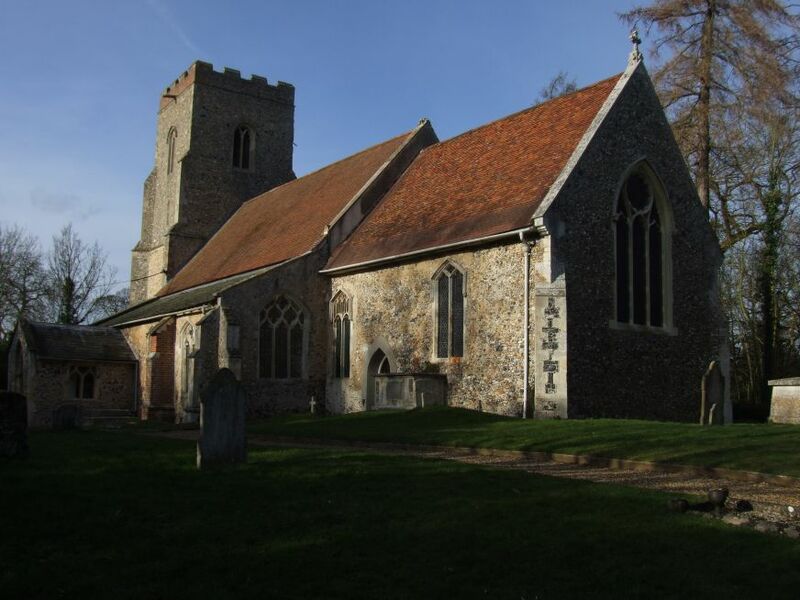 Externally, St Mary is that rare beast in Suffolk, an almost entirely Decorated building. It looks well on its rising ground. 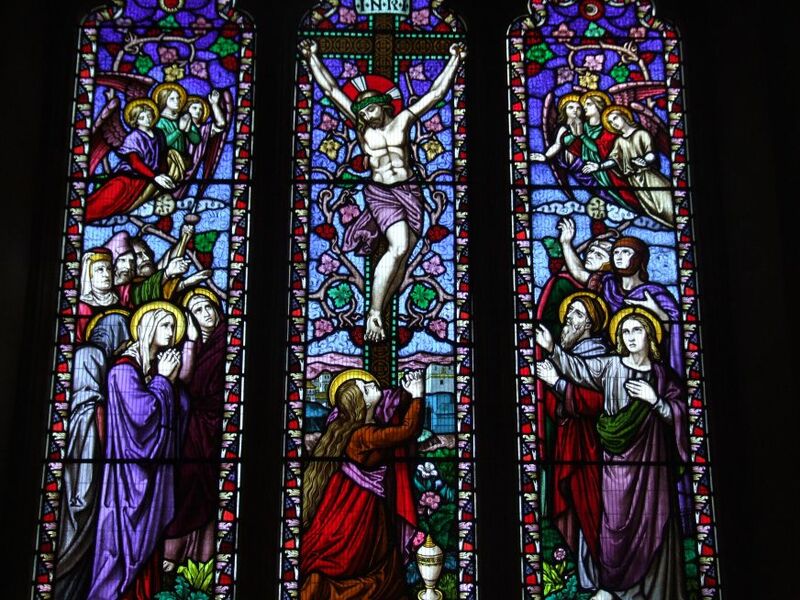 The east window of the chancel is Victorian (how well the paintings did to survive!) and there was a general patching up in the 1860s. You step into a beautiful cool, ancient space, the walls laid with brick, the 19th century furnishings immaculate. Mortlock was right to call it charming. As if the wall paintings were not enough, the sanctuary is contained within another great treasure, the three-sided communion rails. There are fewer than half a dozen sets of these in all East Anglia. 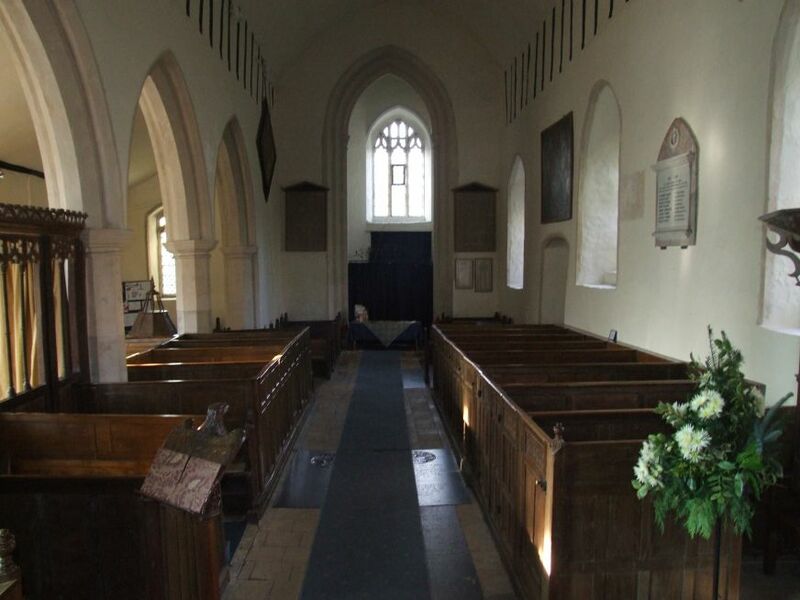 The box pews are complemented by some surviving 15th century benches at the west end of the nave. 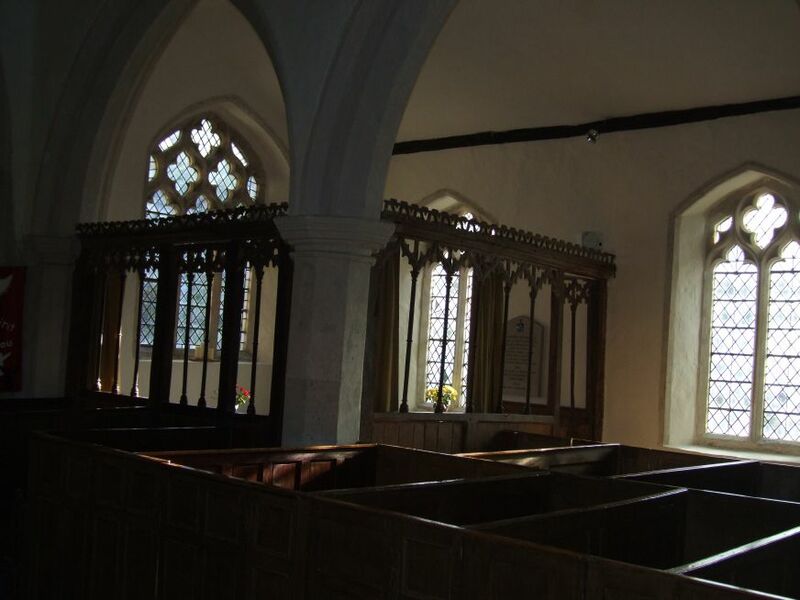 At one time, they may have faced the parclose screen in the south aisle. It is slightly later than the wall paintings, but you can begin to imagine the Catholic life and liturgy of this place by standing in a position where you can see both. 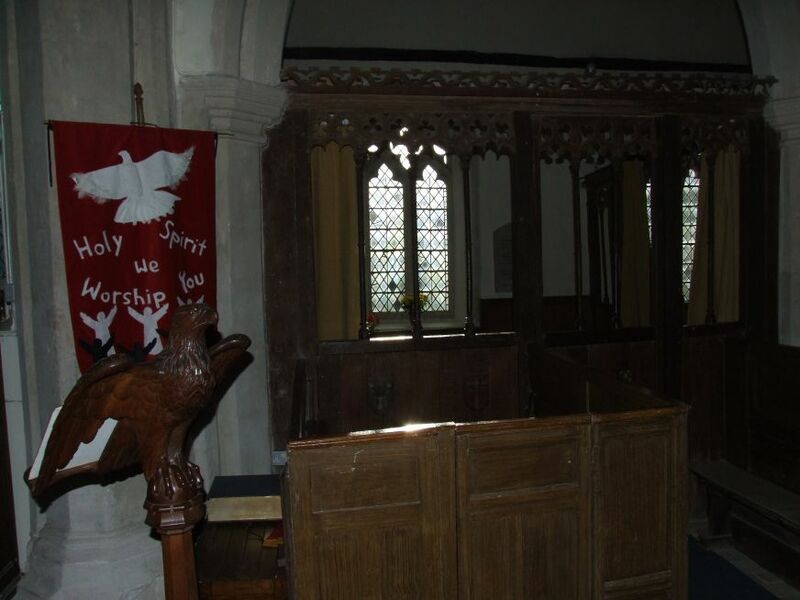 Mortlock thought it the oldest screen in Suffolk, and curiously St John is represented on it by an eagle; more often on screens in Suffolk he is shown by a poisoned chalice, the eagle surviving elsewhere only at Sotherton. The screened chapel later became a family pew. Up in the chancel is one of Suffolk's more dramatic memorials. 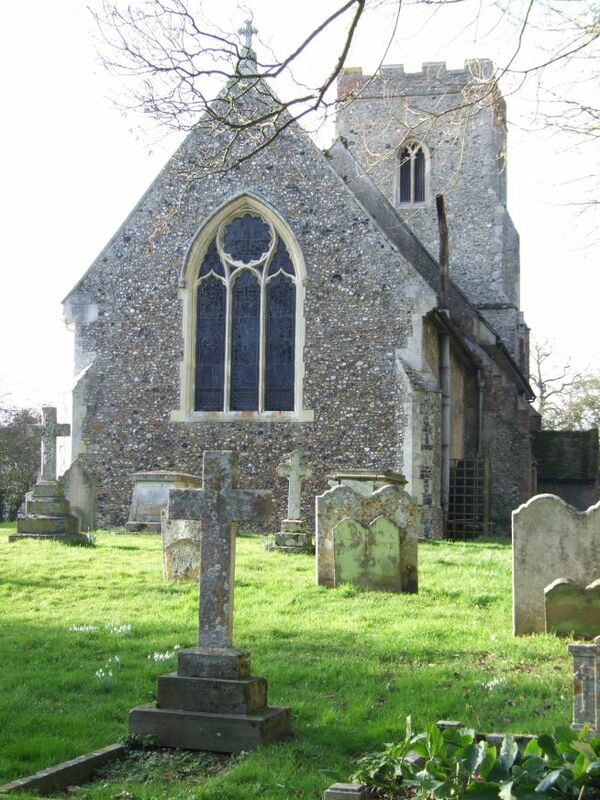 It is to Edward Colman, who died in the 1740s, at a time when many English churches were falling into disrepair, and no doubt welcomed the patronage of those who wished to use the buildings as a kind of mausoleum. Colman reclines life-size behind a spiked iron fence, which looks as if it is there to stop him escaping. These fences are typical of the period, but many must have been removed during World War Two for scrap. There is a pensive smile on his face, as if he is resigning himself to the inevitable. He looks disarmingly like the American actor Kevin Spacey. High above, a crown in heaven waits for him, clasped in the chubby arms of a cherub. Colman stretches out his left hand as if to receive it. Colman's father is remembered for bequeathing to the church a parish library of more than a thousand books. They had their own building, which was demolished in the restoration of 1860; but the volumes had been dispersed some years earlier. Many can now be found in university libraries around the world. The memorial was apparently the work of Thomas Dunne, who built churches for Hawksmoor. The Colmans, and other parishioners, were baptised in the Purbeck marble font with its elegant cover at the west end of the south arcade. A beautiful light falling into this aisle distracted me from the height of the nave, which looks as if it might have been waiting for clerestories and a north aisle before the Reformation intervened. Now, the north wall is home to the royal arms of Queen Anne, relettered for George I, a hatchment, and a surviving biblical inscription from those days when the Elizabethan Settlement tried to make us all into protestants. We wandered back down to the road in the bright sunlight and headed north into the hills, the similarly haunting and beautiful church at Kettlebaston keeping us company on a ridge to the east.